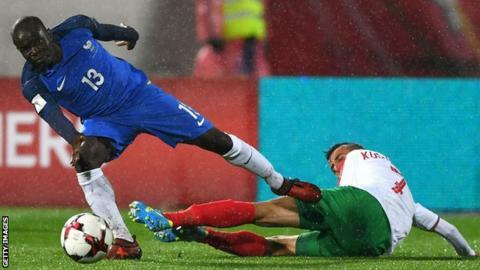 Chelsea say midfielder N'Golo Kante will be missing for another three weeks after picking up a hamstring injury on international duty. The 26-year-old limped out of France's 1-0 win against Bulgaria last weekend and will be out of action until next month. Chelsea manager Antonio Conte says the midfielder will need a scan. Fellow midfielder Danny Drinkwater is "progressing well" from his calf injury but is not ready to make his debut. There was a boost for Conte with the news that striker Alvaro Morata should be fit to face Roma on Wednesday. The former Real Madrid forward pulled his hamstring in the 1-0 defeat by Manchester City before the international break. "He is a big loss for us because we know very well the importance of Kante to our team," said Conte. "We don't have another player with his characteristics. "We may have to adapt some defenders into midfielders." David Luiz has played in midfield before but Conte said he would prefer not to move him, with youngsters Ethan Ampadu or Kyle Scott options to face Crystal Palace on Saturday.